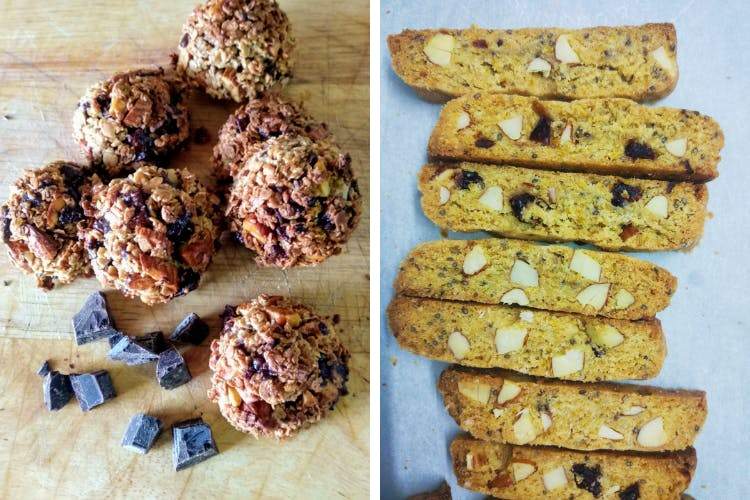 A healthy dose of natural food and superfoods prepared to make a wholesome healthy snack. Torrey Pines Foods brings a delicious, healthy alternative with their famous biscottis, granola bars, lemon loaves and plenty more. Try any snack from Torrey Pines Foods and taste what they call as “quality calories”. Take a pick from whole wheat flour biscottis that come in yummy cranberry flavour or much-adored chocolate flavour. Their granola bars contain a healthy mix of oats, nuts, seeds, dried fruits, and are made with jaggery. They have four different granola bars Power Granola, Choco-Almond, Omega Mix, and Mango Power. All of these provide excellent nutrition with complex carbohydrates, healthy fats, and essential fiber. Phew! That sounds so healthy. But also so delicious! In case you are wondering... yes it is 100 percent healthy! They don’t use eggs either. Ruchita, founder and baker of Torrey Pines Foods believe that good food leads to a better life. Her belief reflects on her products that are made of quality ingredients and are 100% natural and once you try it, you’ll say it’s super awesome too. To try Torrey Pines Products, just order from Flipkart or Amazon. You can also buy their products at Masala Chai and at The Whitefield Market in Adarsh Palm Meadows.